Seoul’s official colors are more than just pretty. They tell the story of a nationits capital. Seoul Colors were introduced in 2009 as part of an effort by the city government to live up its reputation as a trend-forward capital of Asia. Instead of adding splashes of modern colors, the capital draws inspirations from its 600 years of history with a goal to create a balanced cityscape. 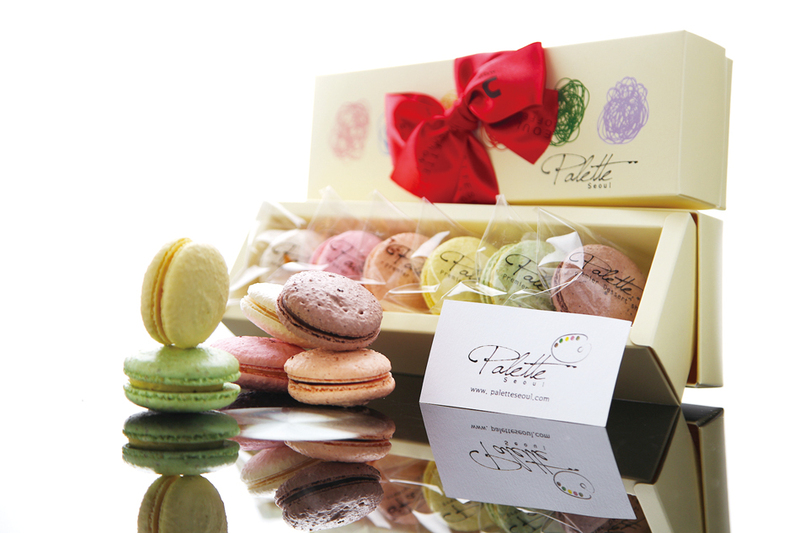 The 10 signature Seoul Colors are not just a celebration of the past, but an effort to have the rapidly developed city find its link with rich history. The Jongchinbu was a ministry that handled the affairs of the royal family during Joseon (1392–1910). Originally located near Gyeongbokgung Palace, the historical building was moved to Jeongdok Public Library in Bukchon in 1981 but was returned to its original home in 2013. You can find it in the rear garden of the MMCA Seoul. 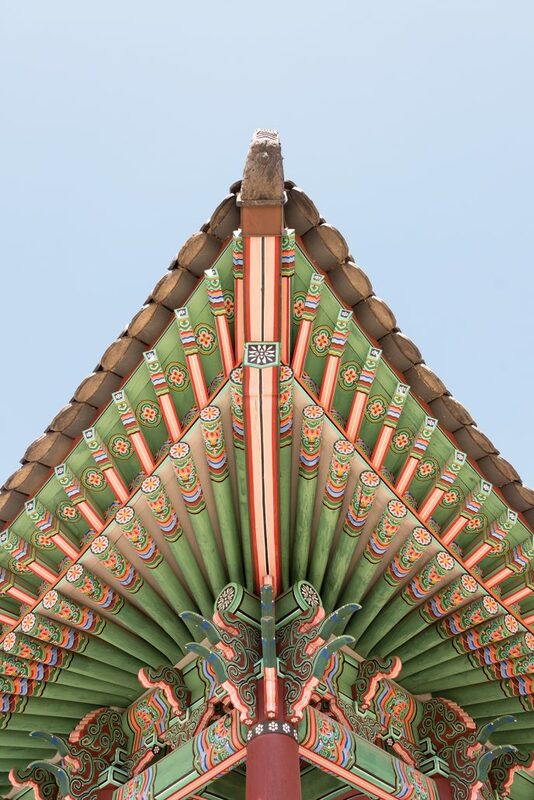 How many of us have paid attention to the ornate paintings on the eaves of a royal palace or Buddhist temple? 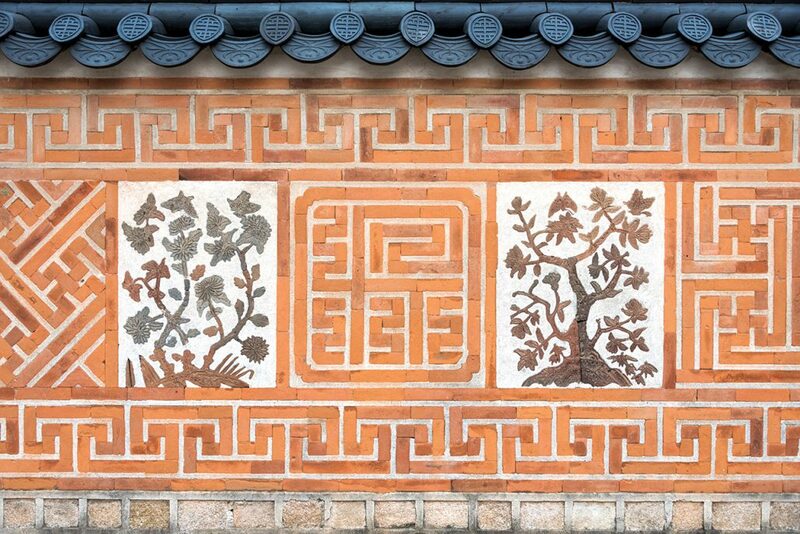 Frequently overlooked, the intricate paintings called dancheong are an indispensable part of traditional public architecture. In the spread of imageries in the five symbolic colors of blue, red, yellow, white and black, the strong, bright red lends a playfulness to the architecture. 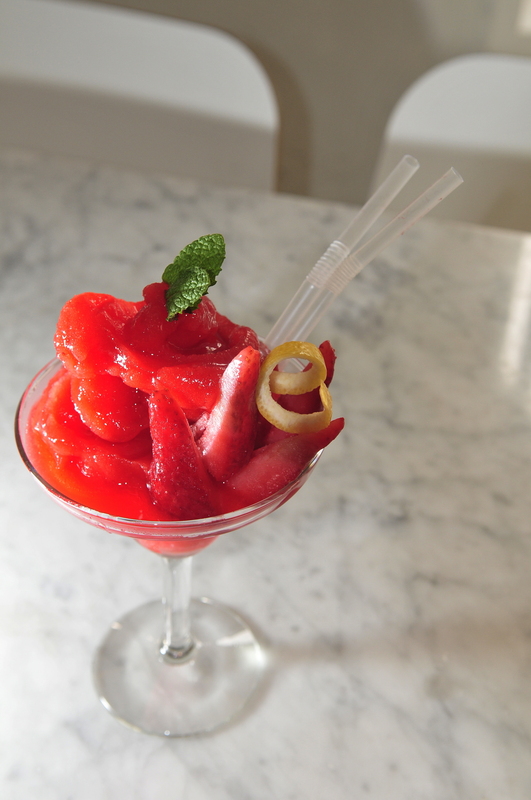 The crimson red serves both spiritual and functional purposes, warding off negative energy and preventing pests. 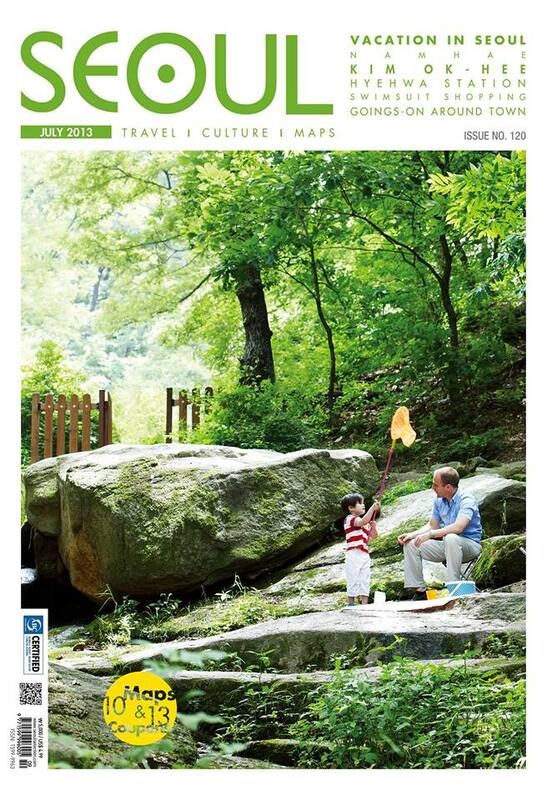 Seoul created today’s Hangang Park in the 1980s as part of the city’s drive to develop the Hangang River. Divided into 11 unique districts, the park runs the entire length of the Hangang River as it passes through Seoul. With walking trails, bike paths, gardens, sports fields and other leisure facilities, the park provides welcome respite to the city’s weary masses. 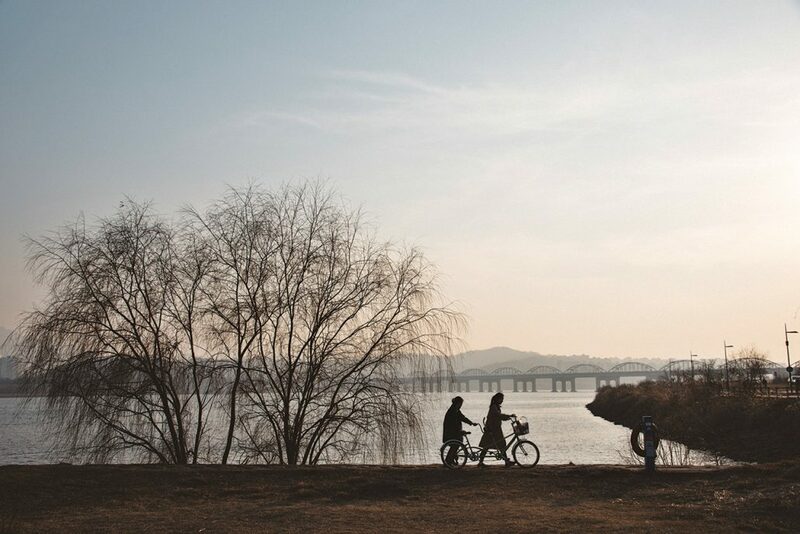 After many frozen days during the unprecedented cold winter, the Hangang River regains its silver shimmer under the warm spring sun. Try riding along the banks of the river in the morning to get the full sight of the glint of sunlight off the river and take in the fresh spring smell. The pleasant scene also accompanies thousands of Seoulites crossing a total of 31 bridges over the river on their morning commute. The silvery white hue proves to be he Koreans’ all-time favorite color: statistics suggest white is the most preferred color for cars in the nation. Located just above Seochon’s Suseongdong Valley, Inwangsan Mountain’s Mumudae Observation Deck offers a panoramic view of downtown Seoul. You used to have to hike to the top of the mountain to get views like this. Not anymore. 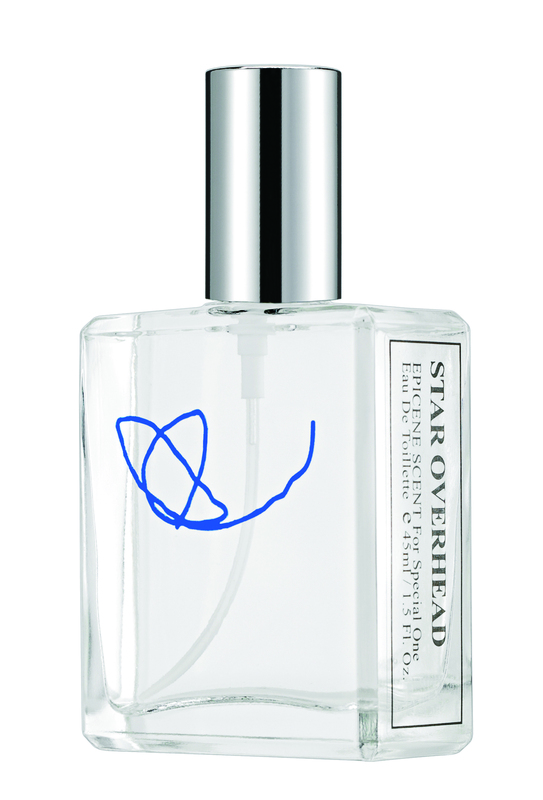 Over the course of years, a clear blue sky has become increasingly treasured by citizens who check air pollution levels as closely as a stock index. A cloudless day reveals the diverse beauties of the capital that go easily unnoticed on dusty days. 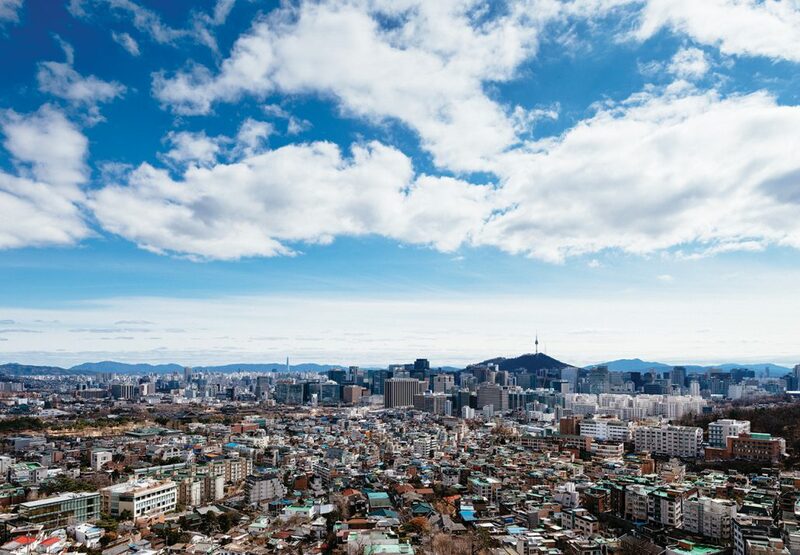 Go up any mountain in the city to get a panoramic view of the bustling capital. One can easily get a view of distant Seoul landmarks such as the Lotte World Tower from an observatory in Bukhansan National Park. Founded in 1395, destroyed in the 16th century, rebuilt in the 19th century, almost completely dismantled in the early 20th century and the target of nearly constant restoration efforts ever since, Gyeongbokgung Palace is witness to over six centuries of drama. As you stroll around its gardens and courtyards, take some time to appreciate the beautiful floral designs on the west wall of Jagyeongjeon Hall, originally built in 1865 as the residence of Queen Dowager Hyoyu. In a sea of monochrome vehicles, Seoul taxis in a warm orange-brown bring a splash of color. Seoul taxis had no signature color until this hue was introduced in 2009. 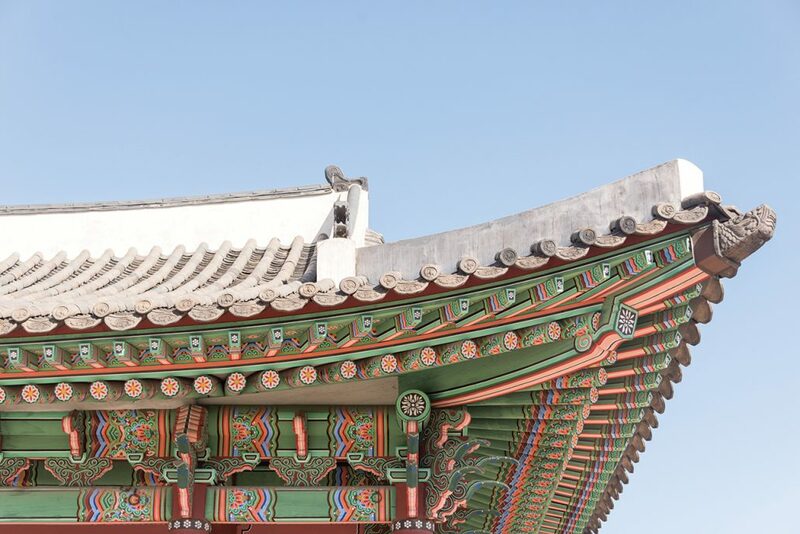 The inspiration for this color can be found at the queen dowager’s residence in Gyeongbokgung Palace. The warm orange hue decorates its brick walls with floral tiles, or kkotdam, setting a feminine ambience in the masculine palace environment. Now the city hopes the color will settle as a symbolic color for taxis like New York’s yellow and London’s black cabs. Beautiful cloisters, or haenggak, line the main courtyard of Gyeongbokgung Palace. 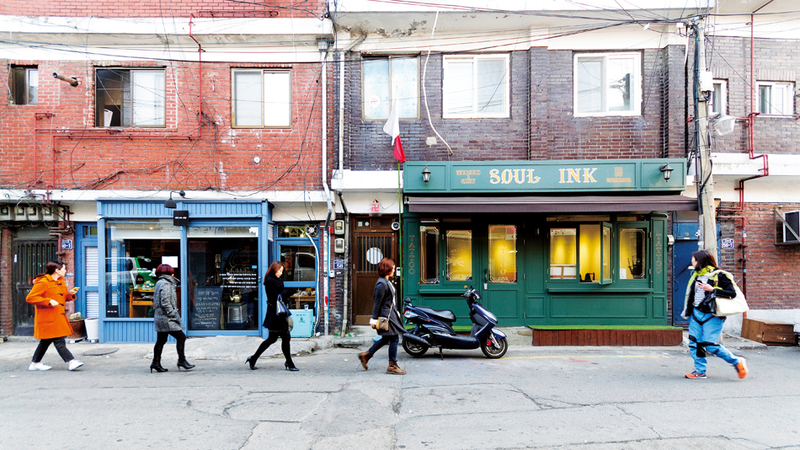 In the days of old, the haenggak functioned as passageways. Nowadays, they also present a stunning backdrop for photos. The rich brown hue of the wooden pillars and gates in Seoul’s royal palaces offers a calming feeling almost like walking in the woods. It strikes a chord with busy urbanites increasingly on the lookout to bring wooden furniture and products into their homes. The mountainous countryside has been a natural provider of wooden materials for palace construction from ancient times. Pine trees, known for resilience, have been popularly used to keep Korean architecture sustainable and durable throughout the centuries. Stretching from Gyeongbokgung Palace in the west to Changdeokgung Palace in the east, Bukchon Hanok Village boasts Seoul’s largest collection of traditional tile roofed homes, or Hanok. 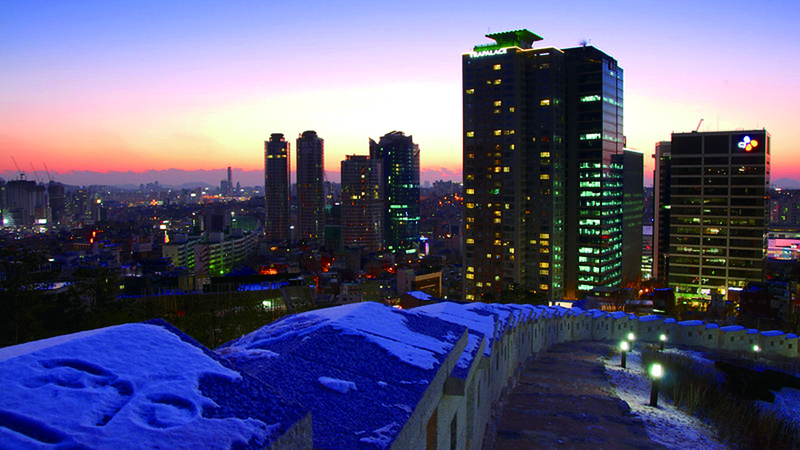 To get a bird’s eye view of the neighborhood, try the Bukchon Observatory, a viewing platform on the top floor of an old brick apartment. 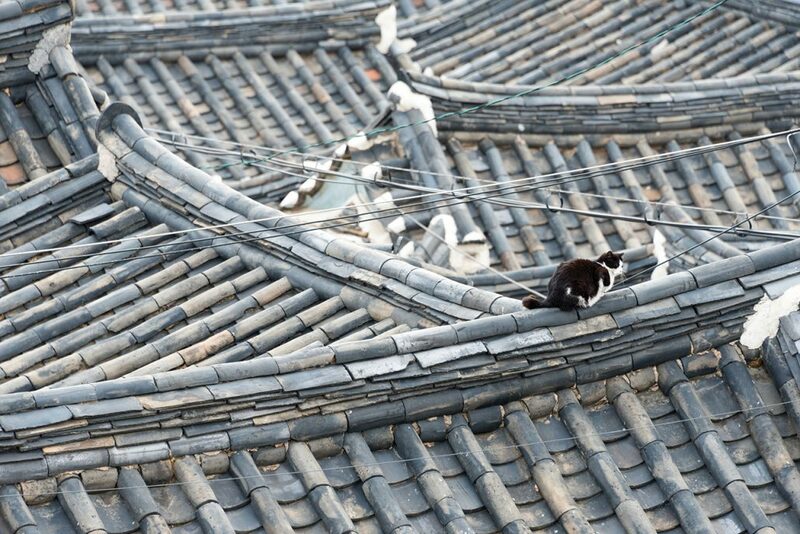 What makes the utilitarian and rustic Hanok roof tiles, or giwa, dark gray? Following a usual process of earthenware making, the initial yellow-brown tiles are showered by smoke from burned pine trees. Through this process, roof tiles are born to offer complete protection against water and all weather conditions. It takes hours to discuss the minutiae of Hanok roof tiles, but take a look at a Hanok roof from any upper level to find a beauty in collective waves of patterns. 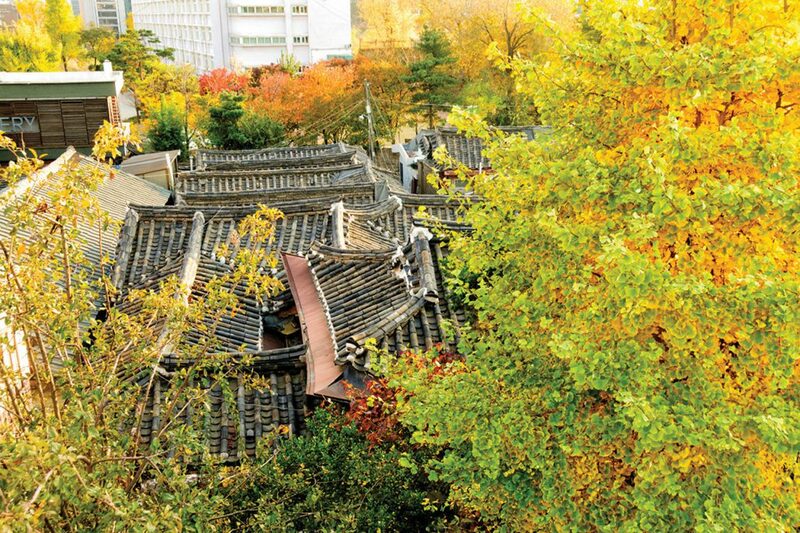 The outer walls of Seoul’s royal palaces offer some of the city’s most pleasant walks, especially in spring and autumn. Though Deoksugung Palace’s promenade is the best known, the outer walls of Gyeongbokgung Palace make for a lovely stroll, too. A walk along the outer stone walls, or doldam, of the royal palaces can be a pleasantly tranquil experience in an otherwise bustling city. The light gray stone walls serves as a versatile backdrop for different groups of Seoul pedestrians. They make for a romantic spot for couples, Instagram-worthy spots for photo-savvy tourists, or a place of respite for hard-working and highly stressed Seoulites. 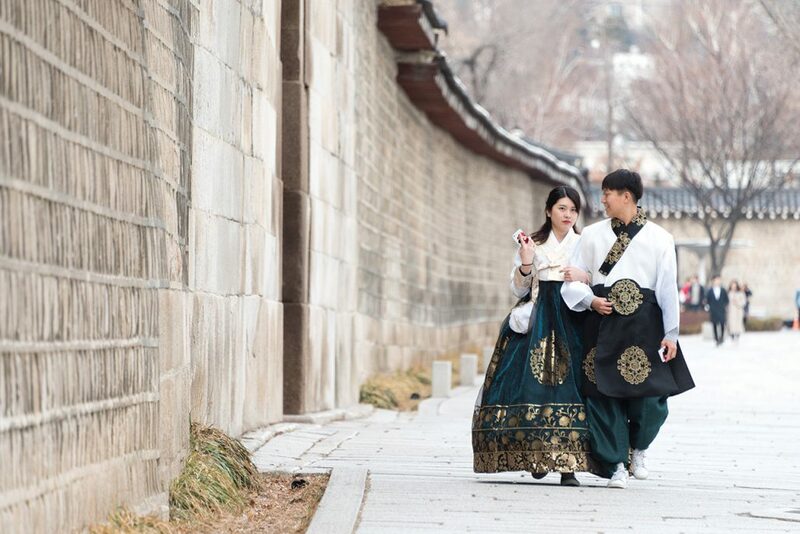 Pick any royal palace and start exploring its outer circles The 1.1 km-long path along the outer wall of Deoksugung Palace is an especially popular walk, although myth has it that couples who complete the stroll will break up in the end. 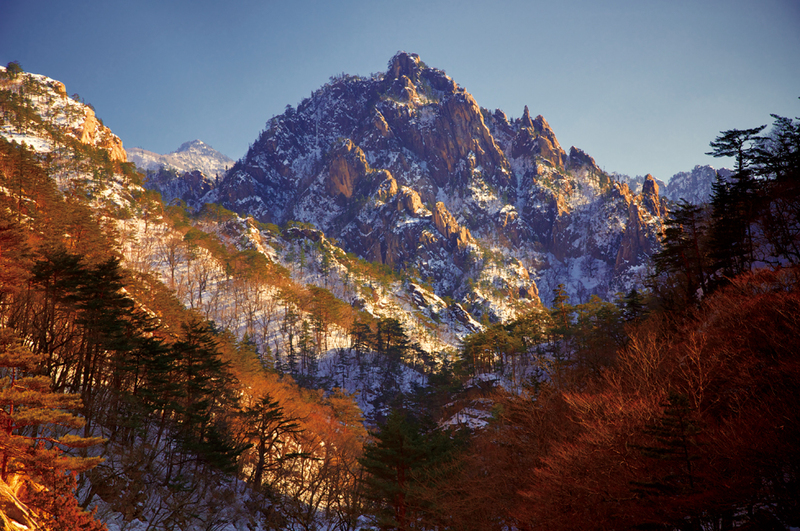 Thick forests of pine trees blanket the slopes of Namsan Mountain. Beneath the dark canopy, a pine forest can inspire reverence and awe, the gnarled, scaly trunks and twisting, tangled limbs suggesting the surreal, the supernatural, that you aren’t alone. 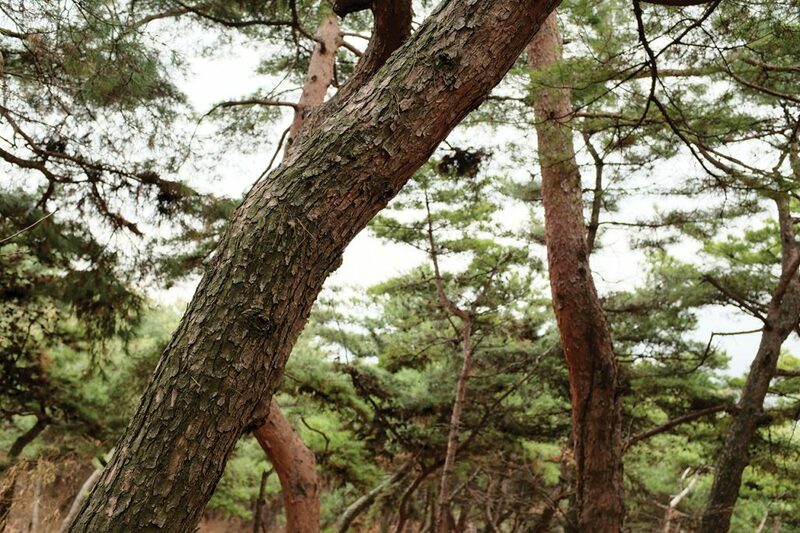 Conifers are one of the most common tree species on Seoul’s landmark Namsan Mountain. The rich forest of evergreen pines keeps the city’s favorite leisure place looking green throughout the year. The trees have symbolized the mountain for far longer than N Seoul Tower. They even appear in the Korean national anthem. The mountain is also home to a collection of 80 different types of endemic Korean pine trees displayed in its wildflower garden, an outdoor arboretum showcasing different plant and flower species. despite being just a kilometer or two from ground zero. They are still alive today. Moreover, fossils suggest the tree has remained largely unchanged for at least 200 million years. The ginkgo yellow beats the maple red during Seoul’s autumn as the former account for almost 40 percent of the city’s street trees. Widely blamed for the stink of their nuts, ginkgo trees, or eunhaeng, are incredibly hardy, withstanding urban air pollution and plant diseases. City authorities have attempted to replace female ginkgo trees, the sources of the unpleasant smell, with male trees. The common sight of older women picking ginkgo seeds in early fall, however, proves the firm status of female trees as a source for one of Koreans’ favorite snacks and dietary supplements. 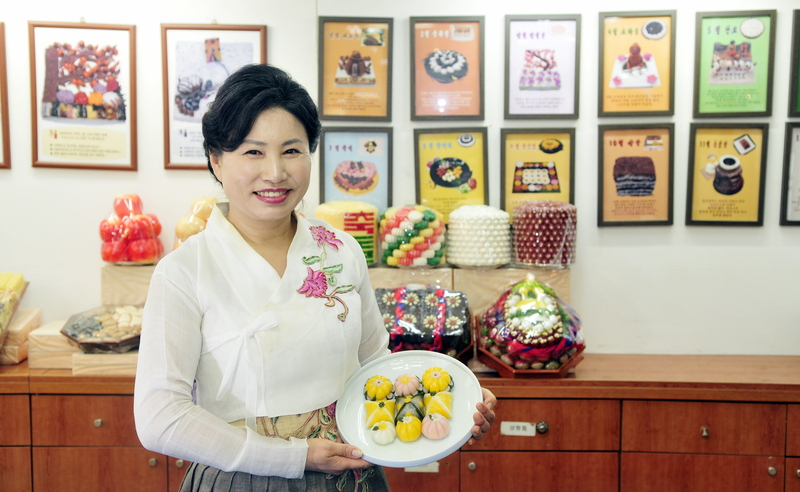 Most visitors know Gwangjang Market for its excellent street food. But the historical market, founded in 1905, is also an excellent place to find clothing materials, traditional Korean attire and vintage apparel. 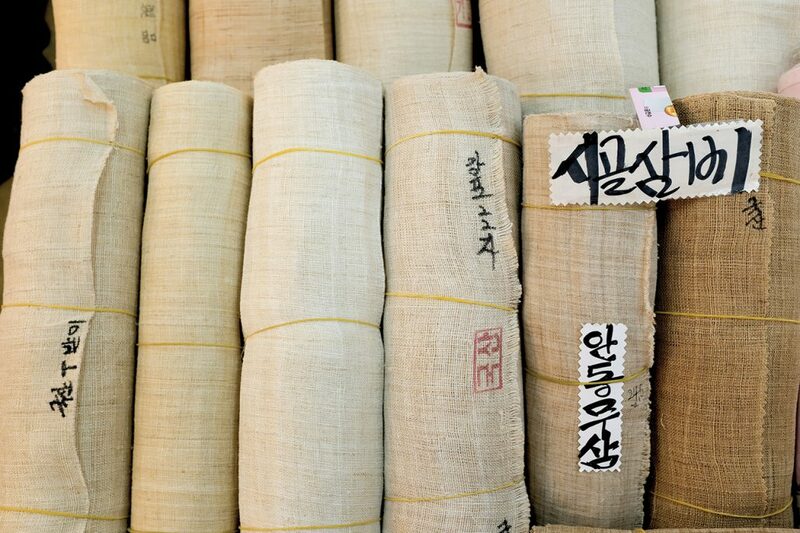 On the first floor of the market, you can find several shops specializing in hempen fabric, or sambe, including the fine Andongpo variety from Andong, Gyeongsangbuk-do.